In The Yoga Mind, you will trace the history and evolution of yoga from the pre-classical through to the contemporary. You will "return to the source" with the study of traditional texts, the Upanishads, the Bhagavad Gita, and the Yoga Sutras, and identify important insights in the flow of ideas that make up the story of yoga. With these reference points and others, you will discuss the different ways in which yogis have contemplated the nature of existence throughout the millennia. In studying the origins of Tantra and Hatha yoga, students will be introduced to the principles of Prana and the subtle energy body. A survey of modern yoga will highlight some of the key figures in its rise in popularity over the past century and help put into context the current myriad of interpretations of this ancient form. During The Yoga Mind, the daily asana, pranayama, and meditation sessions will provide you with a rich and meaningful way to put theory into practice. As a consequence of the journey through The Yoga Mind, students will have new reference points for their own practice and a better understanding of how it fits within the larger tradition of yoga. They will discover new ideas, deepen their understanding of the philosophical underpinnings of the form, and find fresh inspiration for the evolution of their own yoga. Participants in The Yoga Mind will earn 50 hours towards their 200hr Yoga Teacher Training certificate with RTTSYS. The eco-resort is a refreshing oasis in the heart of Chiang Mai city. Shared or private twin rooms (with shared bathrooms) and shared or private superior twin rooms (ensuite bathrooms) are available. Beautifully maintained lush tropical gardens establish a sense of peace and serenity throughout the resort. The spacious and airy practice space is a former rice barn made entirely out of teak wood - a uniquely Thai experience! The delightful 25-meter swimming pool is perfect for swimming and relaxing during your free time. The on-site Barn House Restaurant serves tasty local and international food. There are plenty of Thai and Western food options and coffee shops nearby as well as colorful markets and magical temples to explore on your days off. As a former professional dancer and critically acclaimed choreographer, Gaelen brings a wealth of kinesthetic experience to her yoga teaching. Gaelen’s unique style also combines aspects of Vini yoga, Vinyasa yoga, and Iyengar yoga, and her thoughtfully choreographed classes emphasize the flow of breath as a tool to bring us into a state of dynamic presence. Gaelen’s classes are designed to strengthen and revitalize the physical body, quiet and focus the mind, and rejuvenate the spirit. As a teacher, she is known for her calm clarity, supportive encouragement, and graceful practice. Originally from the UK, Neil has been living in Asia since 1997. He has been practicing yoga for 17 years and has been teaching in Thailand since 2011. He brings to his classes a unique fusion of the many teaching styles - Hatha, Anusara, Iyengar, Sivananda etc, and teachers he has studied with. Neil’s students enjoy his calm presence in the class and his clear and concise alignment instructions. He invites students to utilize the flow of the breath as a primary focus to still the mind while moving the body. Neil is currently teaching classes, Intensives and retreats in and around Chiang mai. Dee teaches yoga asana with an alignment and breath focus. Her classes are a combination of Hatha Slow Flow, Vinyasa, Yoga Nidra and Restorative. She honours the principles and teachings of her Precision Alignment Yoga Teacher Training and her knowledge of Anatomy, Kinesiology and Physiology from her BA (Sci) Human Movement University Degree. Dee's diverse work history, varied volunteering endeavours and extensive world travels have imprinted upon her a sense of global awareness. She is committed to creating and maintaining conscious connections in international Yoga communities. Please book your flight to arrive at Chiang Mai International Airport (CNX). The Eco Resort is an easy 15-minute taxi ride from the Chiang Mai Airport that should cost approximately 250 THB. 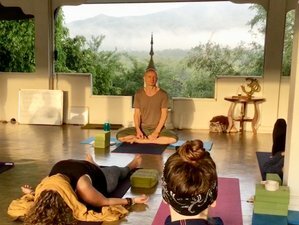 RETURN TO THE SOURCE offers retreats, intensives and trainings in Northern Thailand, that provide a richer and more thorough context for the practice of Yoga.